Accurate segmentation of coronary arteries is important for the diagnosis of cardiovascular diseases. 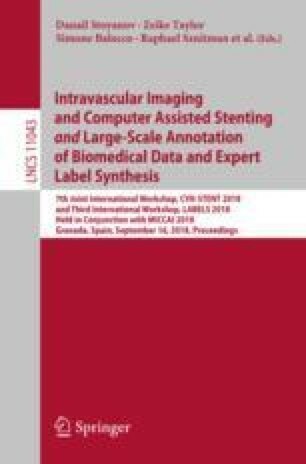 In this paper, we propose a fully convolutional neural network to efficiently delineate the boundaries of the wall and lumen of the coronary arteries using intravascular ultrasound (IVUS) images. Our network addresses multi-label segmentation of the wall and lumen areas at the same time. The primary body of the proposed network is U-shaped which contains the encoding and decoding paths to learn rich hierarchical representations. The multi-scale input layer is adapted to take a multi-scale input. We deploy a multi-label loss function with weighted pixel-wise cross-entropy to alleviate imbalance of the rate of background, wall, and lumen. The proposed method is compared with three existing methods and the segmentation results are measured on four metrics, dice similarity coefficient, Jaccard index, percentage of area difference, and Hausdorff distance on totally 38,478 IVUS images from 35 subjects.